There are a lot of smart locks on the market today, but most of them are designed for a standard, single door. That would make sense, since the vast majority of houses have this kind of door. But what about houses that have double entry doors? The security system used for these houses has to be somewhat different — but it can still include smart locks because there are options for the homeowner to choose from. 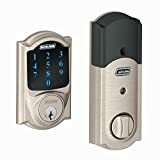 There aren’t as many companies that make these kinds of locks, but there are enough that a homeowner can feel good about the locks they have to choose from. A smart door lock is one that doesn’t use a key for entry, and the way they attach to the door and work isn’t generally set up for double doors. As the demand for these was realized, though, companies started to produce them for customers. 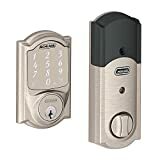 Now it still takes a little bit of extra effort to get a smart door lock, but it’s certainly possible to do so and will provide a homeowner with a high level of peace of mind as they see that they can protect their house the way they want to. It’s also a part of home automation, which is becoming much more popular today with larger groups of homeowners. The lock on a double door is not the same as the lock on a single entry door — and in some cases these double door locks can be more vulnerable to forced entry. A smart door lock, like homekit door lock, can help, but only if the right type is chosen. With a good smart door lock for a double door, the homeowner can have a higher level of peace of mind and can stop worrying about losing their keys, too. Having the right lock for a double door adds strength and security, and reduces the chances that a homeowner will have a break in or other type of forced entry through that door. Of course, there’s no guarantee, but a homeowner who uses the right door locks as part of a good security system will be going a long way toward making their home safer. What Benefits Do Smart Door Locks Offer? With all of those things as benefits for the homeowner, it’s very important that the right smart door lock is chosen. That way the homeowner can feel good about their choice, and can expect to use the door lock without problems for a long time. There are a lot of companies that provide home security, and even more that make products for homeowners to use. Because of that, it’s easy to get a smart door lock. Double doors have fewer options, but a homeowner can still get something they like and feel good about — and then they can choose a company they prefer to monitor their home and its security system. That will help them continue to have the peace of mind, convenience, and comfort they’re really looking for and expect to have in their home.